Dianne Totten, a weaver for 30 years and teacher for twenty, uses a variation of handwoven shibori to produce what she calls “crimp cloth” to create one-of-a-kind garments with the heat-set fabric. 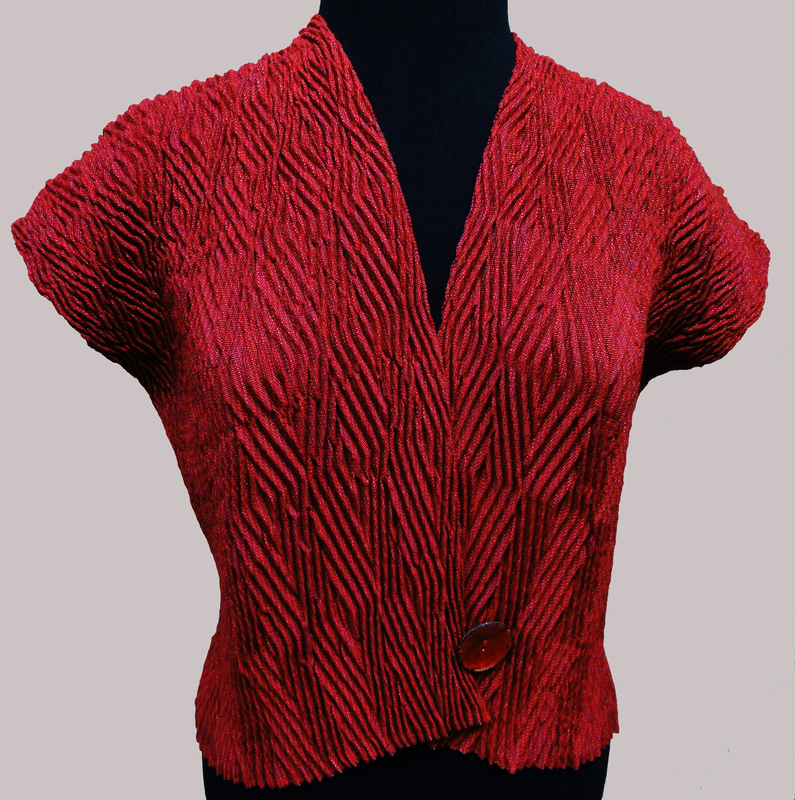 Her expertise in sewing complements her passion for weaving. Dianne’s award-winning work has appeared nationally and internationally. She teaches at John C. Campbell Folk School in NC as well as nationally and internationally for guilds and conferences and has been published in SS&D, Handwoven, Weavers, Complex Weavers Journal, and Vävmagasinet. Väv magazine chose her jacket as “Best in Show” in its category at the Swedish National Convention Fashion Show. I am excited to share with you what I have learned and the techniques I have developed. My latest unique workshop offering is called “Crimp and Create.” Explore this web site to learn more about my workshops and view some of my handwoven garments. How do I order the kit Parrot Plumage Crimped Scarf that is in May/June 2015 Hand Woven magazine. Contact Interweave Press or Weaving Today. Last I heard it was sold out, but I am not kept in the loop on these things, sorry I can’t be more help. When will you teach Crimp at the JCCFS again? Can I do the crimp technique using a rigid heddle loom? Hi Karen, Sorry for the delay in response. Although I am not a rigid heddle weaver, I am sure you can use the crimp technique on a rigid heddle loom. The pull threads would, for the most part, be put in using a pick-up stick. The processing after the cloth is woven would be the same as if woven on a shaft loom. I am making your Crimp Scarf purchased at Convergence, Reno, 2018; Will the crimp come out when handwashed at a later date? No the crimp will not come out when washed if you follow the instructions for steaming. The weft in the kit is a thermoplastic yarn which makes the crimp permanent. DO NOT IRON any of the crimp area or you will lose the crimp. Enjoy your scarf!